With competition as stiff as it is in the dailysportscar.com Cup, it’s sometimes difficult to grasp that the Cup class of the British GT Championship is only in its second year. Progress by the competing teams has come on in leaps and bounds - two to three seconds a lap since last year from some entries - and the pace in the qualifying sessions for the Castle Combe double header was further proof that the standards are rising ever further. 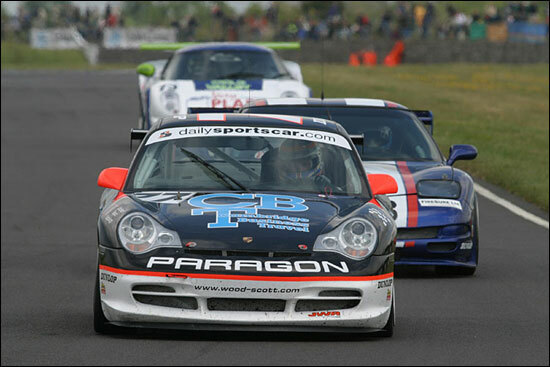 Pole position for the first race was set at a mark almost three seconds quicker than in 2003, a massive margin in motorsport terms, particularly in vehicles where there are strict controls on modifications. 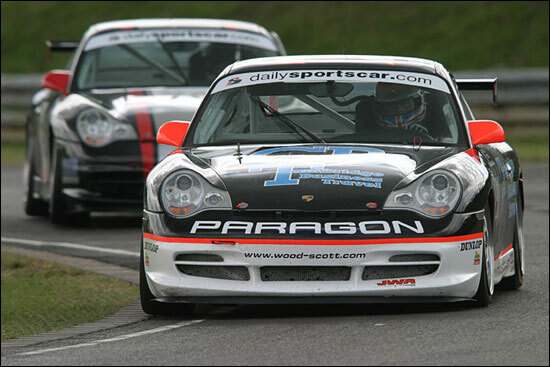 The margin between a time at the top of the sheets and one which will place a car in the lower reaches of the top 10 is now very small, and at Castle Combe, the Wood Scott Racing effort would see the tenths counting against them, tenth and eighth in the two qualifying sessions. This was a tale of a starting stint from Stuart Scott spoilt by a muffed start procedure: “I got a message to abort the start (the race officials had set the lights incorrectly) but was totally swamped as the rest of the field decided to go for it. Suffice to say, I ended up running last. A frustrating opeing stint then. Stuart was an early stopper, handing the car over to Steve as the pitstop window opened, but at least the Safety car had done the team a favour: the field had bunched up and Steve emerged from the stop directly behind a pair of Porsches, and with the opportunity of battling for a podium position, but then………..
“I got a call over the radio that there was fluid leaking from the rear of the car. The instruments all looked fine but then suddenly the temperature went through the roof. We think it was a piece of debris through the cooling system. I shut the engine down immediately and that was it, race over. Steve came around at the end of lap 1 right behind the red JWR car and Plan A went into operation. It worked fairly well, the race pace not quite what Steve was looking for, but there was time to battle away with the very rapid (and very yellow) ABG Motorsport Porsche, before it was time to pit and hand over the car to Stuart. The boys had promised themselves an opportunity to let their hair down after the rigours of preparing for the season and had entered the 911 (and Stuart’s trusty and much loved 944) in a track day on the Monday following the race weekend. 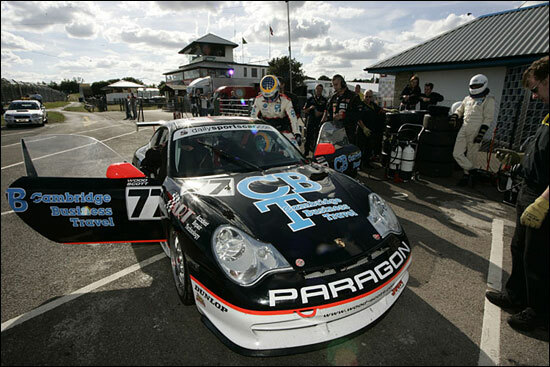 JWR’s Neil Barnett fitted the necessary silencers to the 911 and a high old time was had by all. The boys’ number one fan Lesley (Les) Hayes had an opportunity to see what it looks like and feels like from the passenger seat: her reaction? 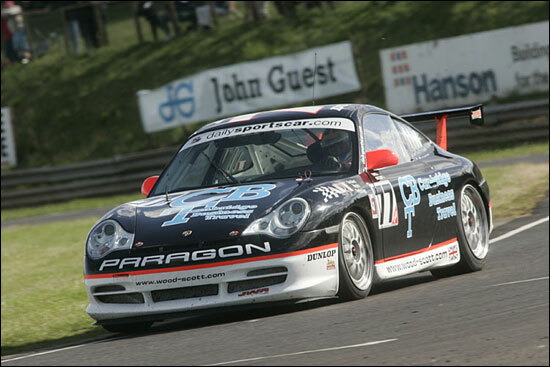 Oulton Park is next, the prettiest track in British Motorsport – The boys won’t be looking at the scenery though, they’ll be battling hard to put the Porsche in amongst the front runners.